« Garden Crotons – Coat of Many Colors! We tried to adjust and have enjoyed quite a few purple camotes, but they are not quite as sweet as we are used to and are not nearly as moist as a yellow/orange yam or sweet potato. We started asking around and found out that occasionally a vendor at the market does have camotes amarillo (yellow sweet potatoes). We bought some and even tried to get some starts budding from those! All of our early attempts at growing yams failed and we realized that the soil around here has too much clay and does not support sweet potato growth well. So, back in November, we determined to confront this problem head-on! Mary found some camote amarillo in the Mega-Maxi supermarket in Manta and bought several. Being rare here they were fairly expensive so, once again, Mary determined to get some slips to grow and ready for planting. This is the first step to getting slips to grow. 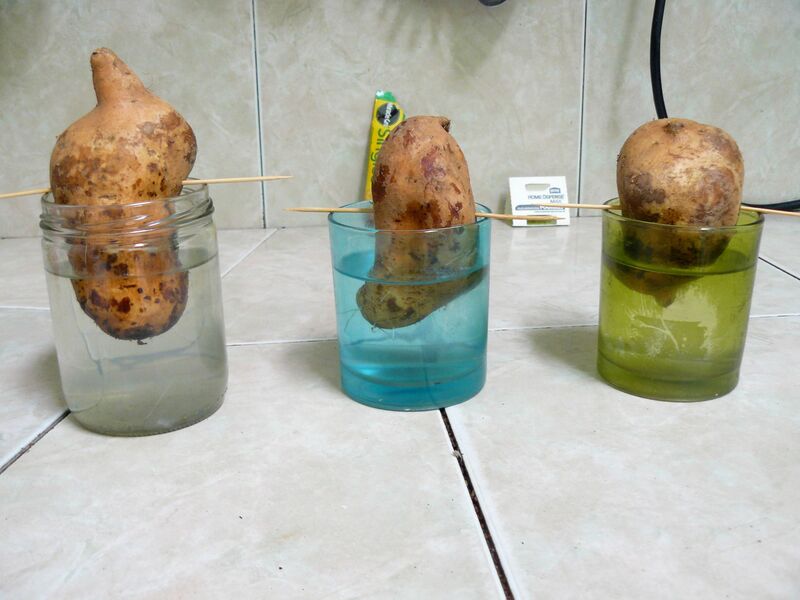 Within days the portion of the potato in the water grows roots and then leaves sprout on the top of the potato. I was tasked with building a grow box that we could fill with suitable soil and enclose to protect the young plants from our ravenous chickens. I got several long lengths of bamboo and stacked them along our back fence line. These green lengths of bamboo had to be sanded, stained and cut to length. 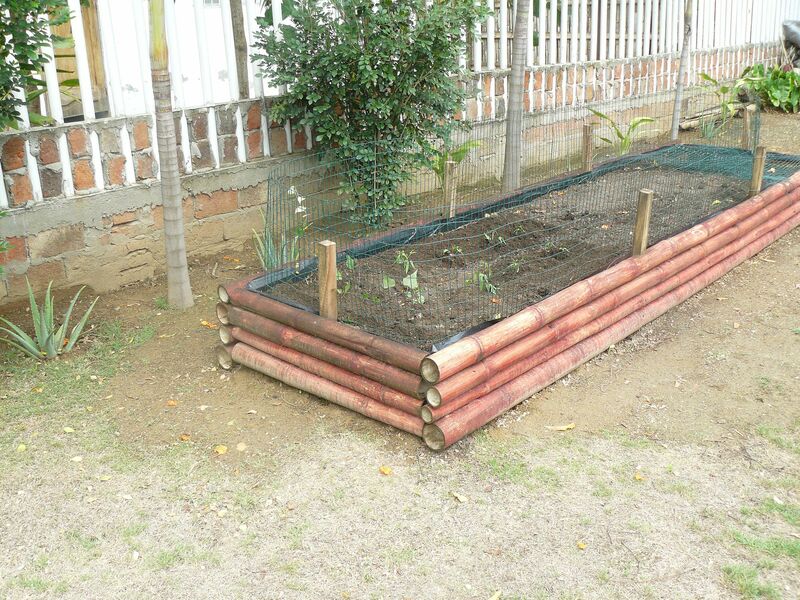 I also got some two by two lumber to link the bamboo together and provide support for the chicken wire fencing. After quite a bit of time, the grow box was completed. I lined the walls with plastic and filled it with rich soil. I attempted to get the wire all the way around the box only to discover I did not have quite enough fencing material left to completely enclose the box. The local hardware stores do not have any more fencing material available now, but Mary’s work area in the storage room was getting overgrown and the bigger plants needed to be moved outdoors! I used all of the fencing I had on hand to enclose about seventy-five percent of the 15′ X 4″ box and Mary and I worked to get the first bunch of comote amarillo planted today. 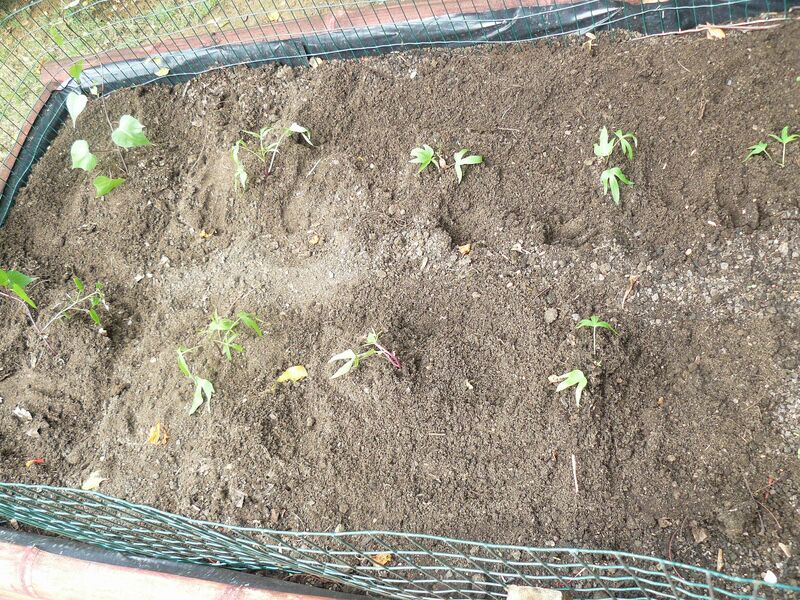 These first few only took about one fourth of the available space, so we will be planting more soon. Without realizing it, we actually started two types of sweet potatoes – regular plants and vines. Only two of the vines made it through the slip process and they are planted near the end to use the fencing material as a trellis. I will not go into the entire process here, but do want to note that Mary did the harder job nursing the slips along to be ready to plant. She has to twist green sprouts from the top of the submerged potato, soak that in water for a few days until it has sufficient roots and then transfer the slips to pots where they grow large enough to be planted and grow outside. Luckily our store-room (actually unused bedroom) has a skylight and the room doubles as a green house area as Mary goes in and waters, mists, and nurses her little potato factory along each day! Thanks, Marcia and a Happy New Year to you! We will keep you posted as the little guys either grow or perish! Yes, thank you! The box looks good even if the plants do not take. But, we are fairly confident that all will go well. Have a great day! Please let us know as the plants progress. I will be sure to post updates. Thanks. Great information. We ask for Peruvian dulce papas here at the local market…more like what we used to have How great will it be for you to have different types at your own home!! It was so funny when we first saw purple sweet potatoes. They really are pretty good, but we wanted the sweeter, more moist sweet potatoes. 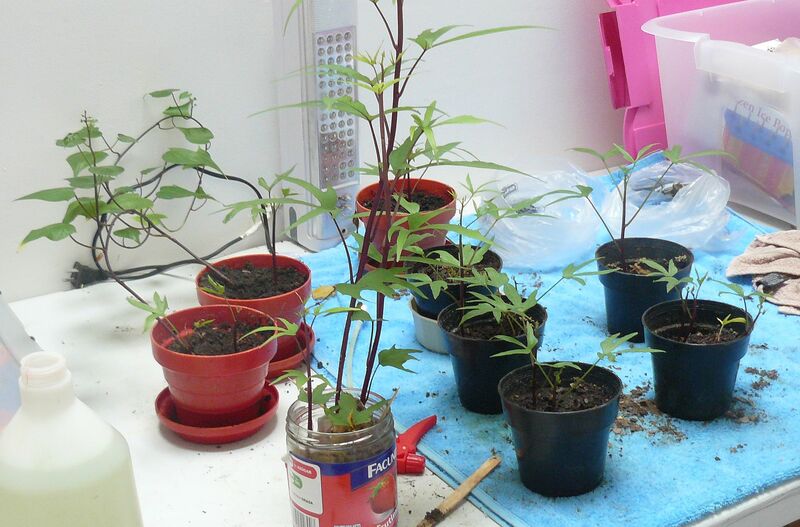 This is what we do here when we can not find what we want in the stores – make it or grow it. It should be fun. Rains continue, and I am sure that the transplants are thriving in their new home! I hope that you have a bumper crop! No kidding on the rain! Last night we got something like three inches.. We are hopeful!